Hello cupcakes, hope you all are having a great time. The rains in Kolkata stopped suddenly and terrible humidity is back again. I am avoiding going out as much as I can. Wrapping up the famous Big Apple Red Lipstick collection, I am going to review the shade Dare To Be Red. The lip colors of this range are good but a little versatility would have been perfect in my opinion. 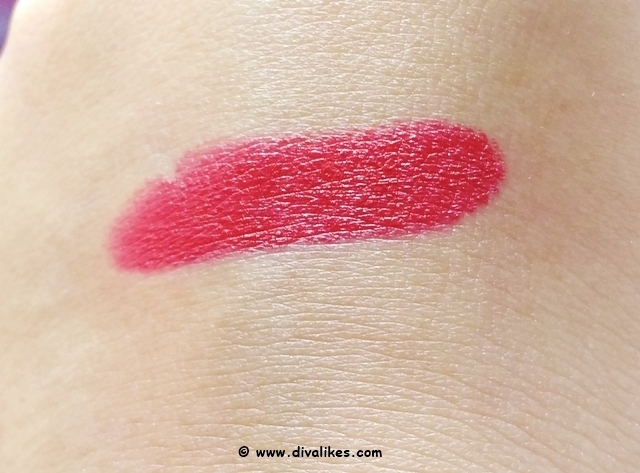 Red lipstick is something every girl needs in her collection, so let's see how good it is and whether it should be included in your collection or not. Packaging: Maybelline Color Show Big Apple Red Creamy Matte Lipstick Dare To Be Red comes in a sleek matte black packaging with a red thin wrapping indicating the shade while the matte touch indicates the range. Additionally, the shade name and number is written on the bottom. The lipstick has the regular twist up packaging which reveals a silver colored body after opening the cap. The lipstick is smaller in comparison and very easy to carry around while traveling. Overall, I loved the packaging. Shade: The shade '210 Dare To Be Red' is a true red with a slight pinkish undertone. The shade is something between the 'Red Liberation' and 'Cosmopolitan Red' from this range. You can also understand the pinkish undertone when the lipstick wears off from the lips slightly or while swatching on the hand. Otherwise, it translates as a true red on the lips. It has never clashed with my super warm skin tone and looks very flattering. Also, the color brightens up the complexion pretty well and would be a perfect red for fair to dusky skin tone easily. Pigmentation: The pigmentation of the lip color is above average and it takes two to three swipes to give a full saturation of color on the lips. Sometimes, I prefer wearing this color little bit darker than usual and pair it up with a maroon lip liner. It is then it makes the color perfect for a party red and also enhances the look of the lips as well. However, even if you don't wear a liner, the color won't bleed at all. Texture: The texture of the lipstick is creamy smooth and glides generously on the lips without tugging or pulling. I suggest scrubbing off every layer of dead cells from the lips so that the color would look flattering rather than accentuating the chapped lips. Even though the range says matte, the color is hydrating and comfortable enough. I don't require a lip balm underneath. The lipsticks are enhanced with moisturizing ingredients and emollients which help to prevent the dryness. Formula: The formula is 'creamy matte' as promised and feels good on the lips. It has a slight sheen which can be made completely matte by blotting or patting translucent powder on top. The original formula of the lipstick is very transferable and I completely hate this aspect. Staying Power: The lipstick stayed on my lips for around 4-5 hours with little munching and drinks. It does fade off almost 80% after heavy meals and can only be elongated with a lip liner underneath. You can also use a concealer to extend the staying power. The shade '210 Dare to be Red' is a true red with a slight pinkish undertone. The color brightens up the complexion pretty well and would be a perfect red for fair to dusky skin tone easily. Staying power is around 4-5 hours. The range could have been a bit more versatile. No doubt I love this Big Apple Red collection but honestly, buying one shade from this collection is worth. This is because all the four reds are similar to each other. Rest assured the quality is very good and comfortable to wear. Therefore, see which red suits you the best and go for that one. Rightly said, one shade is all I would go for. I really wish they showed some creativity with the reds especially when they priced it well. I was expecting some kind of light reds and Maroon reds actually. The shade is so gorgeous!